Bringing Seifuku to the World! 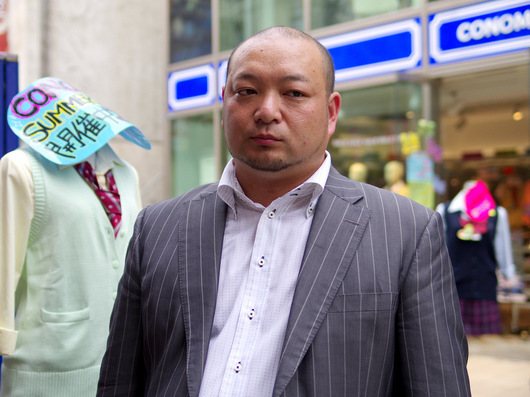 After taking over his mother's clothing store in the city of Myoko, Niigata prefecture, Mr. Aiura made a splash by marketing nanchatte seifuku. In 2008, he opened a store in Tokyo's Harajuku district and launched his own brand. He continues to attract attention not only in Japan but overseas as well, showing his work at seifuku fashion shows as far and wide as France (Paris), Italy (Rome), Brazil, China, and South Korea. The term nanchatte seifuku describes a type of standard outfit based on girls' school uniforms but with various style adaptations. Many high school girls whose schools have no required uniform choose to go to school in nanchatte seifuku rather than in their regular casual clothes. Japanese high school students in the 1960s rebelled against the school system, and one of their demands was for the abolition of uniforms; they wanted more freedom in choosing what to wear to school. As a result, many schools did indeed do away with school uniforms. 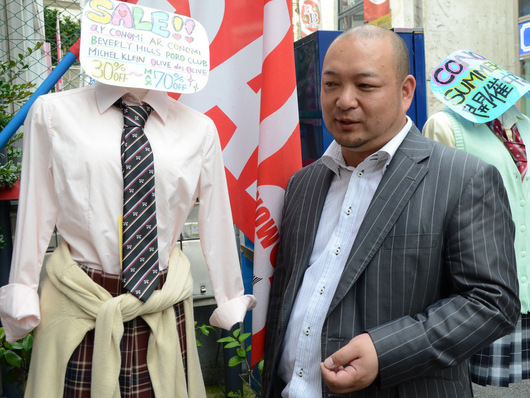 Mr. Aiura, regarded as one of the main instigators of the recent nanchatte seifuku boom, tells us that in his high school days he was among those calling for the abolition of school uniforms. So why is he now making uniforms? I think it was around the year 2000. A local high school girl and her mother came into the clothing store I run in a small town in Niigata prefecture. The girl told me that even though her school had done away with uniforms, she still wanted to wear a uniform to school. The school happened to be my own alma mater. When I was a student there, I was constantly calling on the school to loosen the school uniform rules. Particularly for girls, there were all kinds of finicky regulations about uniforms--the skirt had to cover the knees, the jacket had to be a certain length, and so on. I used to wear a kind of remodeled uniform with baggy pants and a shortened jacket, which invariably landed me in trouble with the teachers. I couldn't see why the clothes we wore to school had to be so strictly regulated. To me, a school uniform was like a straitjacket. Five or six years later, the school abolished uniforms. And yet, here in my shop was a student who wanted to wear one. I couldn't figure out why. "You're lucky to be able to wear whatever you like to school," I told her. "In our day, my friends and I would've loved to be able to wear our own fashions to school, but we weren't allowed to." But she was adamant that she wanted to wear a uniform. I was quite taken aback. We ended up chatting for an hour or two, and as we talked I gradually came to understand where she was coming from. The right school uniform can really bring out a high school girl's attractive features. And if it's a "uniform" that she herself has picked out and arranged, then it's not at all a form of constraint or control. Listening to this young woman explain her craving for a pretty uniform of her own choosing, I felt a fire ignite inside me. Right, I thought, if that's what she wants, then my job is to give it to her. I ended up making her a pleated skirt with a deep-red plaid. She chose the fabric, and I created a pattern tailored to her measurements and made the skirt according to her instructions, including about the height of the hemline. That was the start of my journey into the world of nanchatte seifuku. That young woman began bringing her friends to the store, and the trend spread from there. The CONOMi store in Harajuku is on Takeshita-dori (Takeshita Street), a mecca for teen shoppers in Tokyo. 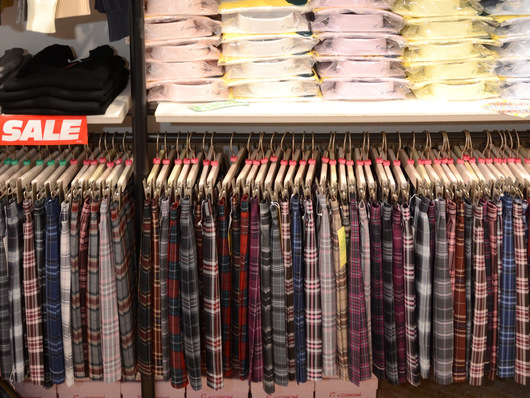 The plaids of the skirts on the racks may look the same at first glance, but in fact we now have some 40 different kinds. High school kids are very fussy about the slightest differences, which is not surprising when you consider they wear the skirts almost every day. About four years ago, we started creating our own fabrics as well. Using a slightly finer or thicker weave for plaid can completely alter its overall look. Mr. Aiura explains how even a one-thread difference in the thickness of the lines in a plaid design can make a big difference to how it looks. Prior to that, we used fabrics from clothing manufacturers, but plaids put forward by adults are not the same as the ones high school kids are looking for. And patterns evolve through ongoing trends too--large or small squares, soft or deep colors, classic designs, and so on. Students' pattern preferences even vary according to their high school grade; as upperclassmen, the second- and third-year girls don't want to look the same as the first-years. I think the great strength of our store is that we sell our own creations, so we can ask the customers directly what they're looking for and immediately incorporate their input when making the skirts. We're very particular even about things like the details of socks. And there are many fine points to think about--slight variations in color, different thicknesses of ribbing, and so on. From the outside, seifuku fashion might seem like a fairly narrow field, but once you get into it, there's actually a lot to it. 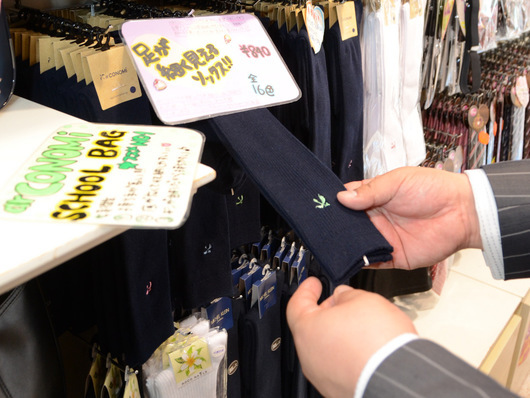 "These socks may look the same," explains Mr. Aiura, "but in fact the ribbing is different in thickness. This type with very thin ribbing makes your legs look slender, and the ones that actually squeeze your legs in a little are also quite popular. How your legs look is crucial when you're wearing seifuku." Above all, we're very fussy about quality. The girls wear these skirts for three years, so we can't have the pleats coming out or the fabric wearing out after only a short while. It's crucial that these clothes keep their shape even with day-to-day wear. Aiming for the highest standards of professional workmanship in both quality and design, we do everything ourselves, from spinning the thread and dyeing to fabric-making and sewing. The plaids of the items we sell at CONOMi are not available anywhere else. I'm told that some high school students opt to wear nanchatte seifuku simply because it saves time in the morning or because they find it too troublesome to pick out different clothes every day, and I think that's fine too. Even those girls are very meticulous about details, selecting different ribbons, ties, and socks to wear from one day to the next. That's part of fashion as well. So while we want to pay close attention to detail anyway, we also get a lot of input and support from high school girls that help us develop and maintain those exacting standards. 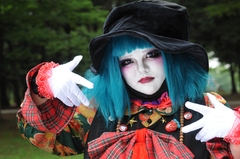 I think Japan should do more to inform the broader world about Japanese fashion. There's a lot of overseas interest in Harajuku-based Japanese street fashion, and I think the seifuku is another branch of Japanese style with the potential for broad international appeal. We've held fashion shows in various countries, from France and Italy to South Korea, China, Russia, and Brazil. Even though most people haven't heard of the CONOMi brand, the mere fact that the theme is seifuku always brings thousands of people to the shows. Some people see the uniforms as a kind of cosplay, but there are also many who regard them as a form of general fashion--something to wear around town. As soon as a style like this gets a reputation, you get copycat items appearing on the market. But I would urge prospective buyers to come and feel the real thing. Attention to detail, attention to quality--that's what puts the genuine article above the rest. In terms of quality and aesthetic sense, copies will always be just copies, never as good as the original. 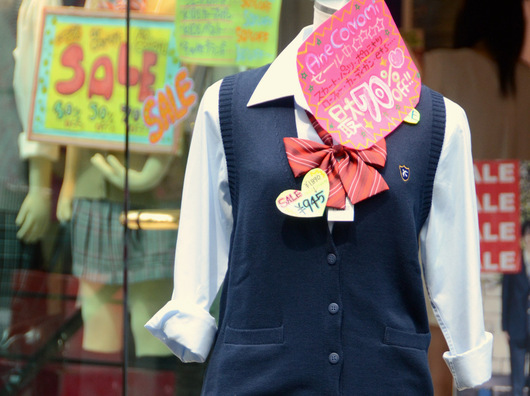 Until now, shops specializing in school uniforms have hardly been the sort of places people are eager to shop in, but our aim is to provide seifuku that young people look forward to buying and seifuku shops that they look forward to browsing in. We're a uniform supplier, but at the same time we want our stores to have the look and feel of fashion boutiques. That's why we chose Harajuku as the location for our first Tokyo store. We want to give customers the experience of buying the kind of seifuku they've been dreaming of at a hot store in a hot fashion district. And we want to encourage the spread of that keen appreciation for seifuku fashion throughout Japan and throughout the world. In fact, we already have customers coming from abroad specifically to shop at CONOMi, which naturally we're delighted about. Tips on coordinating your seifuku outfit to best effect. In July 2012, CONOMi conducted a fashion show and a limited-time sales offer at the Isetan department store in Shenyang, China. High School Real Talk: Fashion Boosts Our Spirits!